This tiny worm became temporarily paralyzed when scientists fed it a light-sensitive material, or "photoswitch," and then exposed it to ultraviolet light. Ever since a Canadian team of scientists revealed they had figured out how to paralyze worms - and then cure the paralysis - just by flashing the worms with different beams of light, Neil Branda has been asked the same question over and over. What animal is he going to paralyze next? None, as a matter of fact, he says. The worms simply served as a dramatic confirmation of the first known ability to use light as a means of switching a biological function on and off, and it could have major implications for fields ranging from optical memory to medical surgery in humans. Light switching has been used for years in non-biological systems, such as transition lenses that darken when exposed to light, and then reverse the process when the light dims. But this is different. "Nobody we know of has put light switching into live organisms and then shown a reversible biological effect, at least to the best of our knowledge," chemist Neil Branda, leader of the team of researchers at Simon Fraser University in British Columbia said in a telephone interview. The findings were published in the current issue of the Journal of the American Chemical Society. The researchers designed a molecule that "for several complicated reasons" they thought would induce paralysis in tiny transparent worms, C. elegans, when exposed to ultraviolet light. The molecule was dissolved in an aqueous solution and then "orally administered" to hundreds of nematodes, which turned blue and went into paralysis. That was expected, because similar experiments have been done in labs around the world. 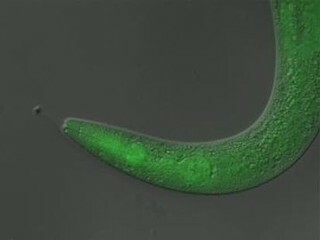 However, when the worms were hit with visible light, the process was reversed and the nematodes regained their mobility and appeared "as if they had never been paralyzed," the study reports. Why is that such a big deal? Light is already used to switch on biological functions for treatment of arthritis and several types of cancer, called photodynamic therapy, but once the process is switched on, it can't be switched off. Thus the drug remains active for some time - at least four weeks according to the Mayo Clinic - so patients have to avoid bright lights for six weeks to keep the activated drug from doing extensive damage elsewhere in the body.